The rise and fall of German idealism: Ludwig Philipp Thümmig: Institutions of the Wolffian philosophy provided for the use of academics - Do animals have souls? Ludwig Philipp Thümmig: Institutions of the Wolffian philosophy provided for the use of academics - Do animals have souls? Thümmig's psychology or theory of soul remains familiarly Wolffian in its main characteristics. Human soul certainly exists, Thümmig says, because we are conscious of many things and being conscious presupposes something that is conscious. Furthermore, this conscious being or soul cannot be material, because material or in general complex objects could not form a continuous unity out of its experiences. Thus, souls must be simple entities defined by their unique force or striving towards perfection. Then again, Thümmig does not wish to dminish the role of body. On the contrary, he supports Leibnizian idea of a harmony between soul and body – changes in the soul are reflected in body and vice versa, because God has set the two to work in harmony, although neither has any true effect on the other. Thümmig's consideration of the doctrine bears an obvious resemblance to Bilfinger's discussion. As both works appeared in the same year, the reason for the similarity is probably to be found in discussions between the Wolffians. Particularly noteworthy is that both locate the bodily element corresponding to soul in brain. 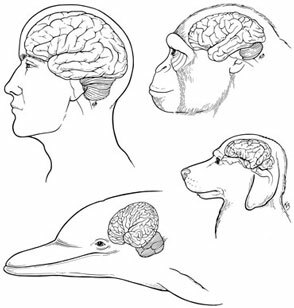 Thümmig notes now that human brain is similar to brains of many animals. As the human brains are in a sense the physical manifestation of human soul, Thümmig suggests that animal brain is also a manifestation of a soul. In effect, Thümmig is advocating the idea that animals are also souled and therefore aware of their environment. This is important as the first opinion on the question of animal psychology in the Wolffian school. Animals then have soul, but what sort of capacities are their soul is supposed to have? Animals do have sense organs, just like men – eyes, ears and noses. Thus, it is reasonable to suppose that they are capable of having perceptual experiences – they can, for instance, have an experience of redness, when their eyes come in contact with red light. The question of conceptual capacities of animals is more difficult. Thümmig states that concepts as such cannot be directly manifested in the brain. He apparently thinks that even perceptions occur in brain as some sort of physical images – picture of a rose is somehow imprinted on the mind. Now, instead of concepts, words referring to concepts might well be imprinted in this manner, which would explain what corresponds to thinking in human brains. Thümmig takes it granted that animals do not usually have any language skills – even parrots do not really talk. Thus, no words as such are imprinted in the animal brains and therefore they cannot at least have abstract thoughts without any clear perceptual content. Thümmig is thus saying that animals do have sensations, but not concepts. As we have seen, in Wolffian philosophy the difference between sensations and concepts is one of degree: sensations are at best clear, while concepts might be more or less distinct cognitions. In other words, animals can distinguish e.g. apples from pears, but they cannot define what is it in apples that differentiates them from pears. In Wolffian philosophy, reasoning was seen as an essentially conceptual process. Thus, Thümmig couldn't admit that animals had any capacity for reasoning. This appears strange, because animals appear to make inferences. For instance, if a dog smells a piece of food coming from under two boxes and it cannot find any food from one box, it appears to know that the smell originates from the other box – in this case the dog has apparently deduced from statements of the form ”p or q” and ”not p” the third statement ”q”. Thümmig solves the dilemma by introducing the idea of a reasonlike behaviour – a non-concpetual capacity analogous to reason is operating in the dog's mind. In other words, dog has instincts that simulate the conscious use of reason. So much for animal psychology. Next time I'll be moving to the second part of the book.